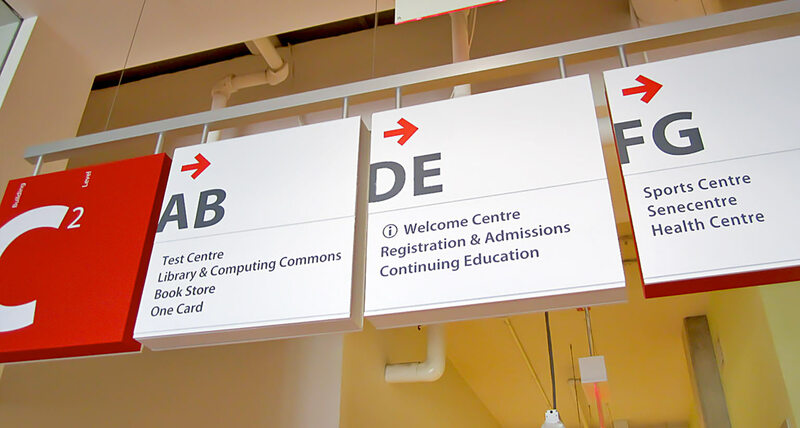 A new wayfinding program was developed for Seneca College that provided greater visibility and seamless directional signing for both students and guests. 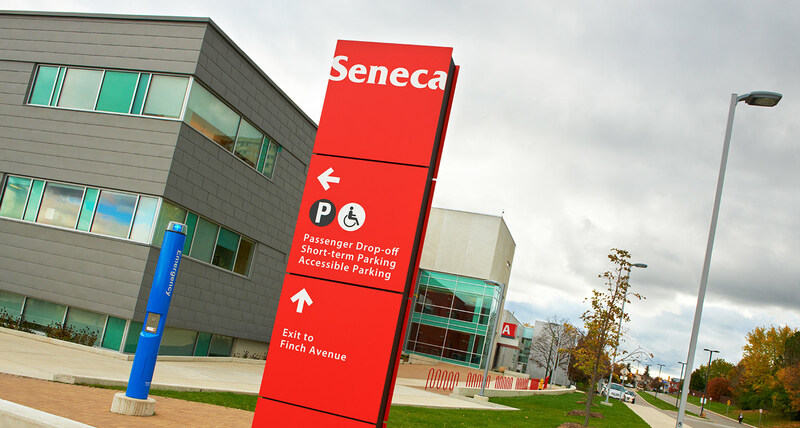 Seneca College was established during the formation of Ontario’s college system in 1967. 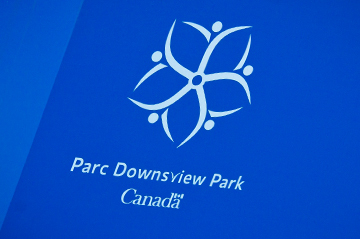 The school was founded as part of a provincial initiative to provide career-oriented diploma and certificate courses, as well as continuing education programs to Ontario communities. 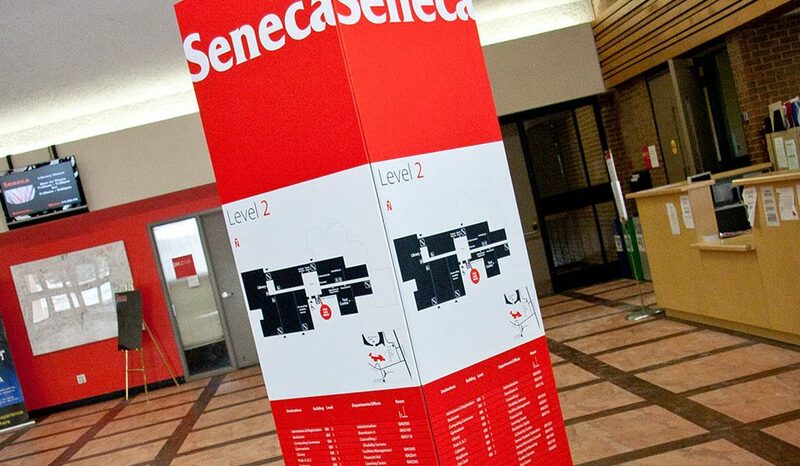 Seneca has four main campuses, and a total of 10 campuses located throughout the Greater Toronto Area. 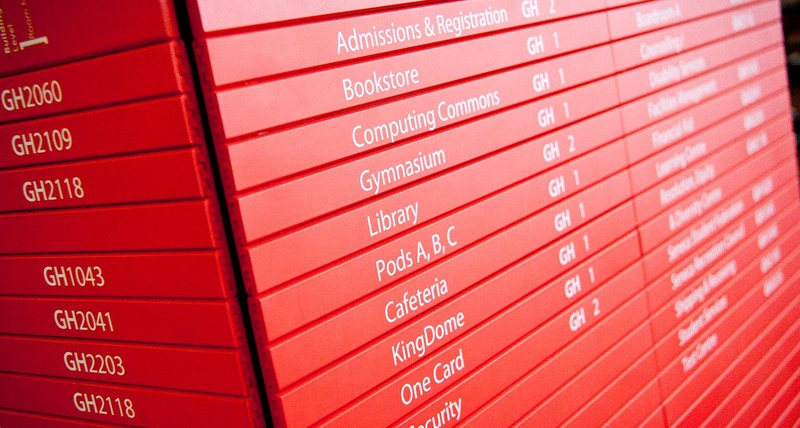 Each campus has its own academic specialties. 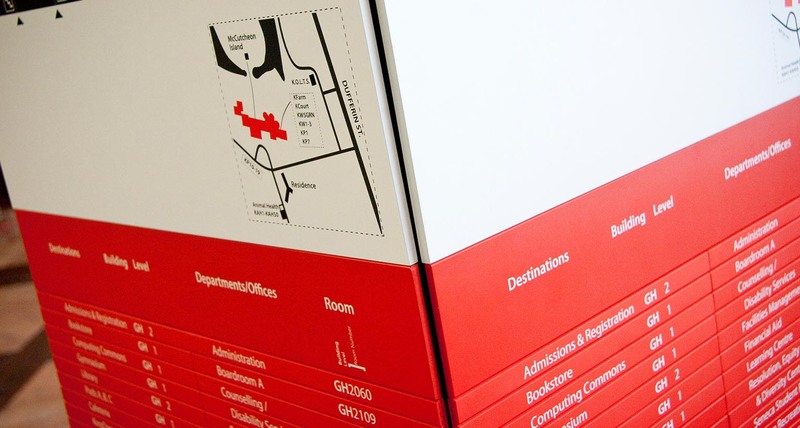 In 2010, the college initiated a wayfinding project to help enhance the staff and student experience. 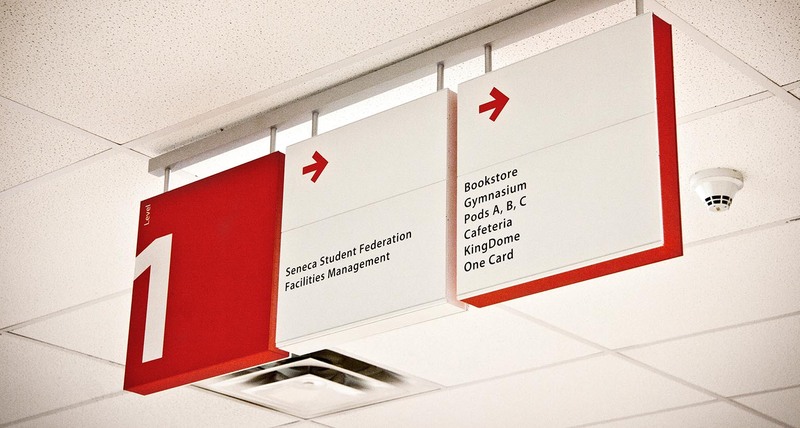 Seneca College commissioned Shikatani Lacroix to create a comprehensive wayfinding master plan for the exterior and interior wayfinding of its 40-year-old campuses. 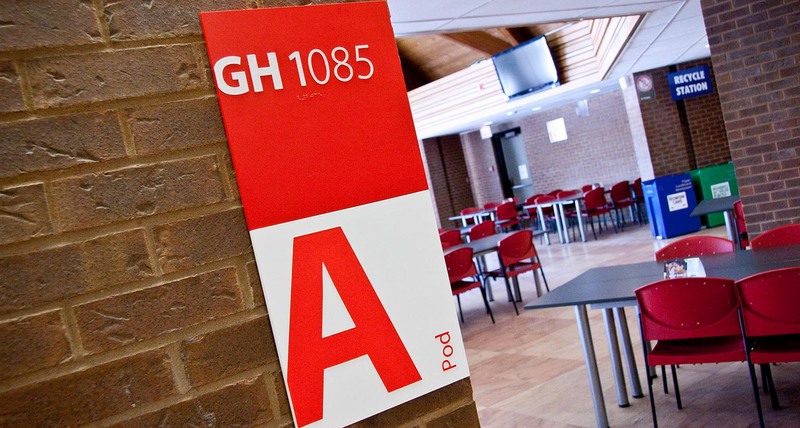 Shikatani Lacroix was challenged with designing a system that built on and expanded the current visual equity of the Seneca brand that was already in place within the campus. 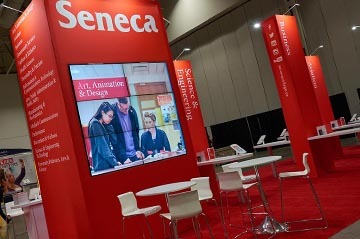 The transition needed to be seamless and cohesive to maintain the integrity of Seneca’s brand identity. 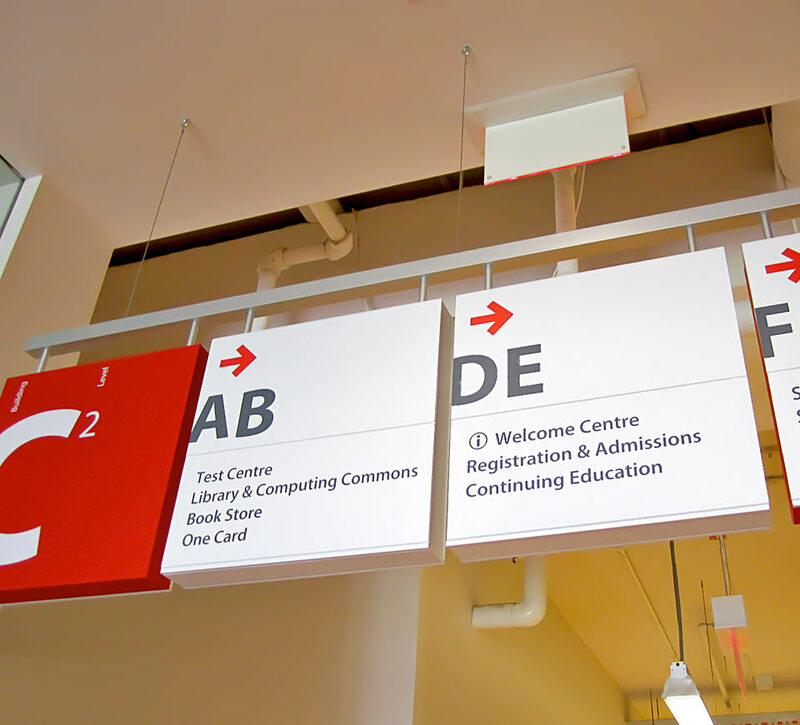 The majority of the campuses was different and lacked any kind of wayfinding system or building architecture. In addition, the Newnham Campus located on Finch Avenue consisted of a cluster of different buildings added through the years and accessible from a centrally located large open parking area. The entrances for each wing were not clearly identified and floor levels between buildings did not always align. 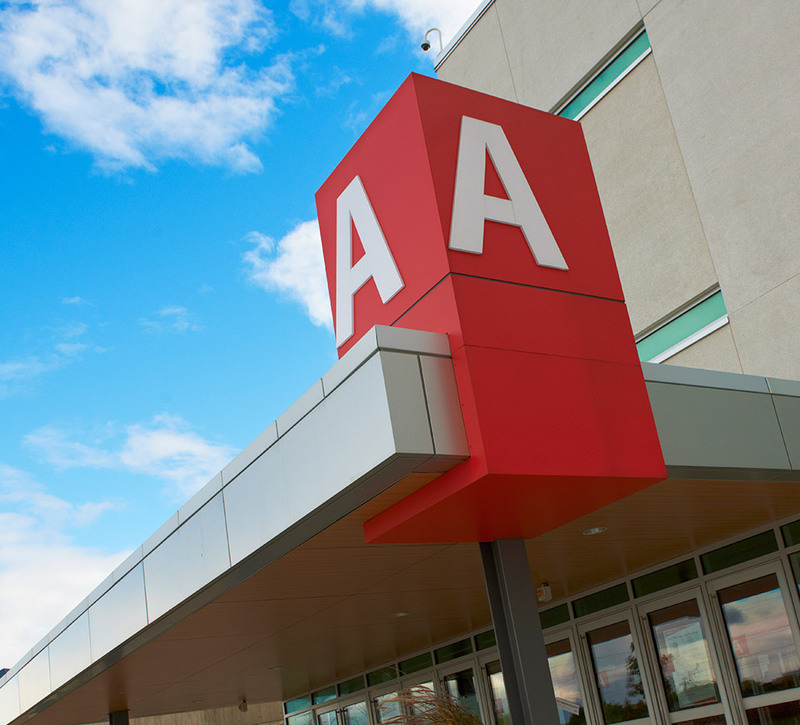 The wayfinding project was initially underfunded and therefore required a phased approach while ensuring each phase remained consistent to the overall program. Our strategic approach to design ensures that the solution we provide meets all business objectives and budget requirements. 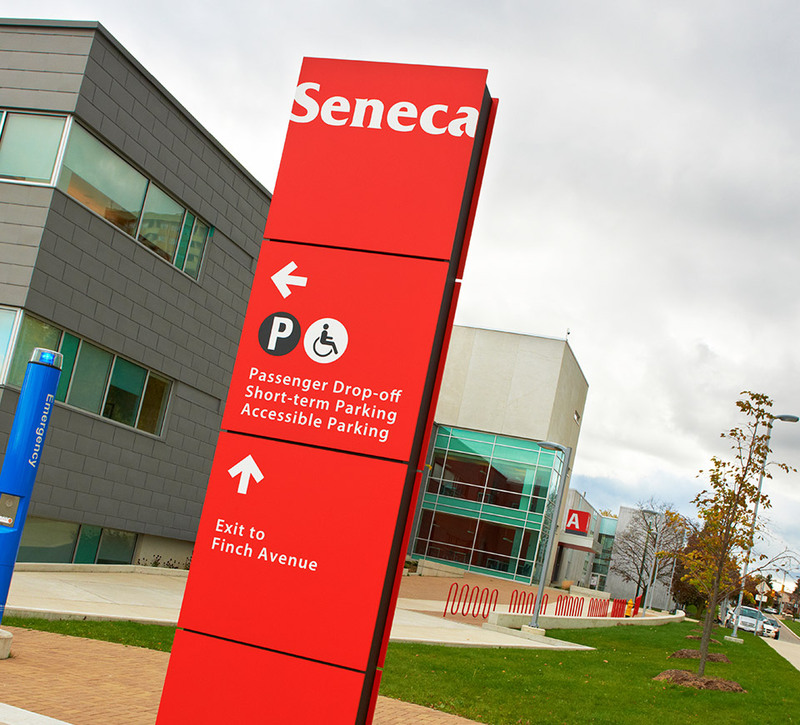 For Seneca, it was essential to have a strong understanding of student and staff attitudes towards navigating the campus. 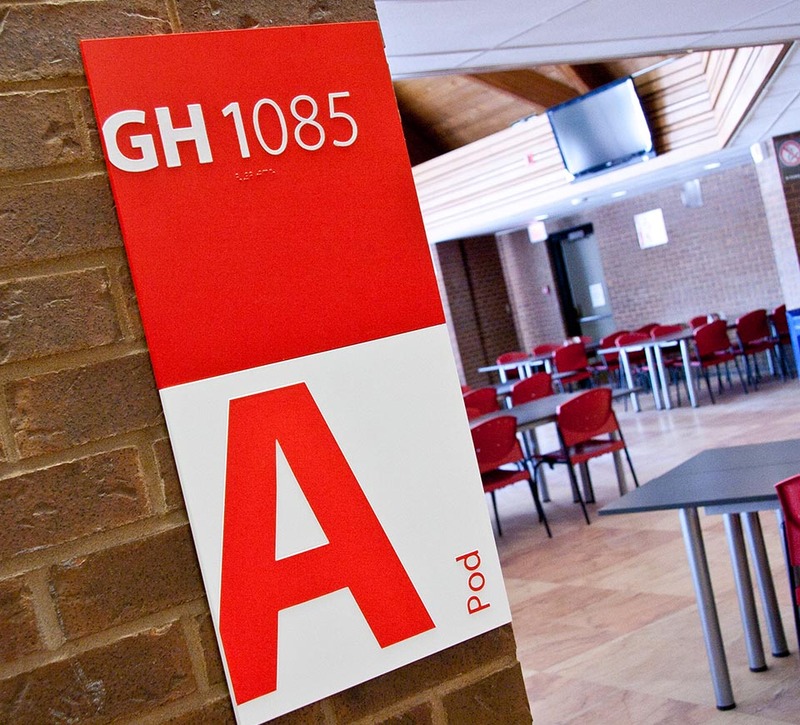 The project process allowed Seneca College management, staff and students a platform to provide input and alignment to the final direction. The design process also demonstrated how the new program could be cost effectively applied to the remaining campuses. It was also necessary to look at the entire journey across the various campuses and departments to ensure a cohesive and consistent approach. 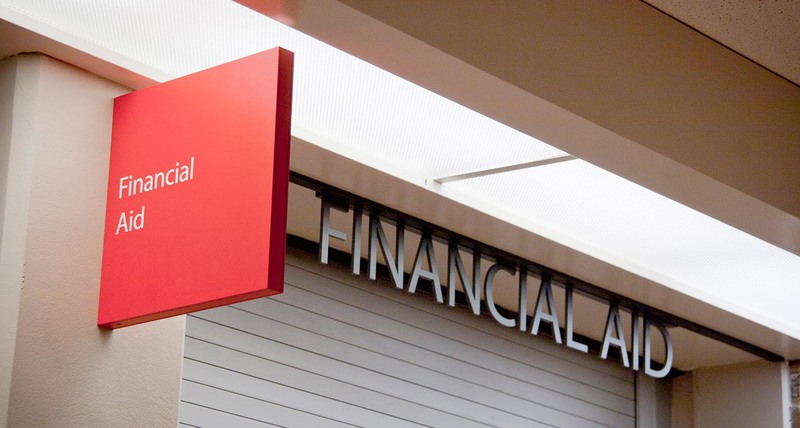 This allowed us to identify the best design solution that would support the ideal navigation, starting from the main gateway, through to the desired room, while consistently supporting Seneca’s brand identity and personality. 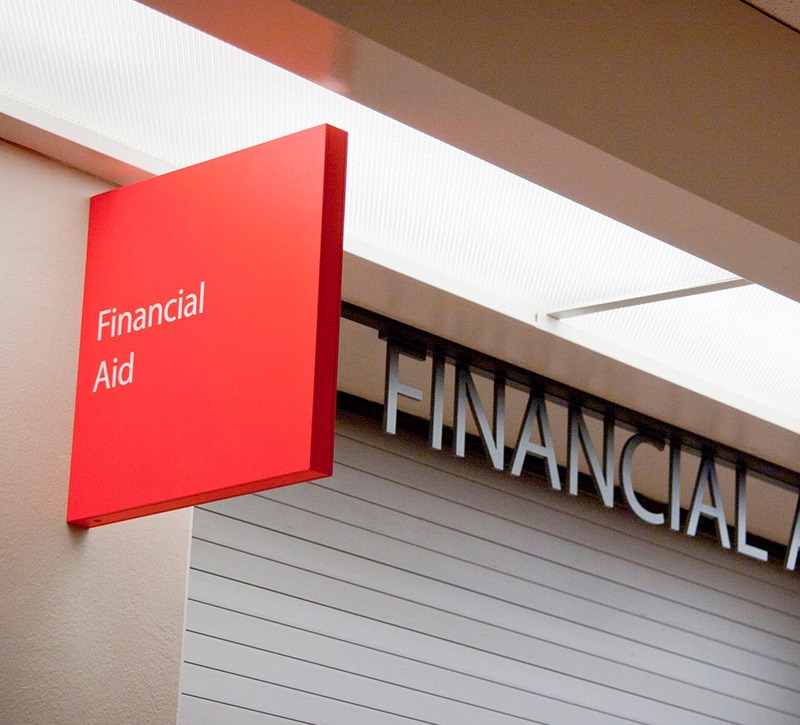 In order to garner the consumers’ trust, it was critical that the identity leveraged current visual cues while increasing the college’s values. Our SWOT analysis took an in-depth look at the current programs within the facilities and mapped out a focused path to ensure final directional signing success. 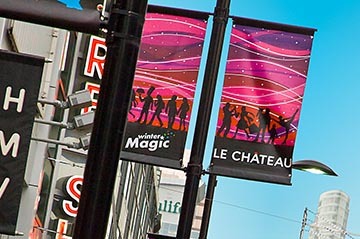 A critical facet of any wayfinding initiative is the ability to clearly define the key visual and structural elements of the program. Our alignment process uses visual metaphors to help define the Seneca journey and key equity levers to allow for a seamless and coherent execution across the various campuses. Shikatani Lacroix chose to leverage Seneca’s “red square,” a strong and recognizable shape. The team identified this key element as the building block on which to construct the entire system. 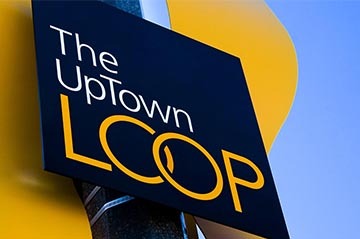 The result is an easily identifiable system that uses simple and easy to understand nomenclature and hierarchy of communication to clearly communicate the user’s location within the maze of sprawling buildings. 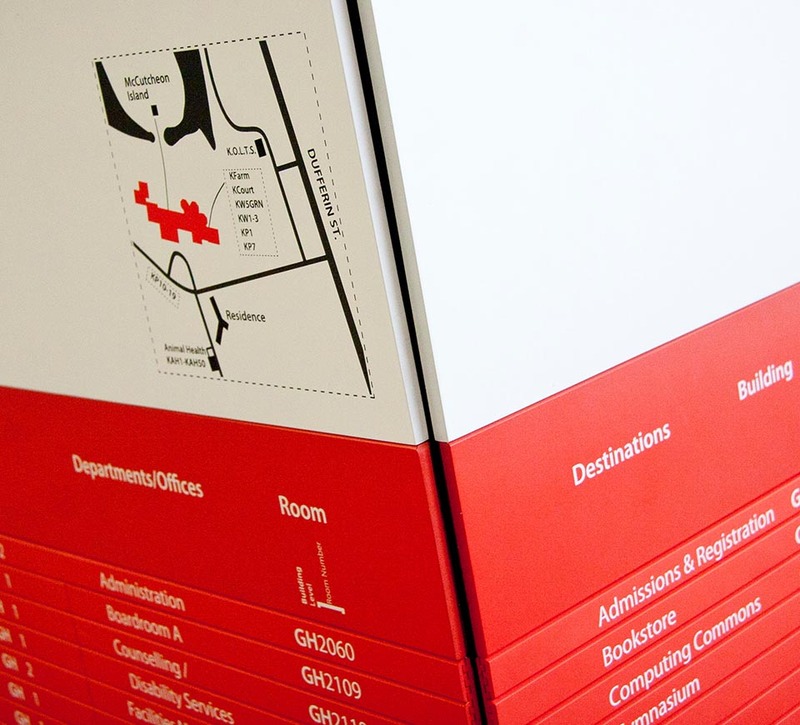 For the Newnham Campus, we explored a range of pathway navigational signs which leveraged the Seneca dominant red brand colour and identity. 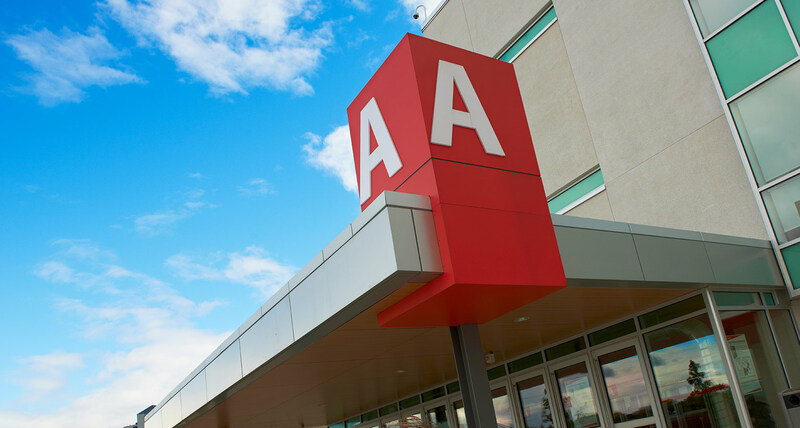 Exterior building signs were designed to become architectural icons with great visibility from the large parking lots, allowing for a clear path to the main entrances to the building. 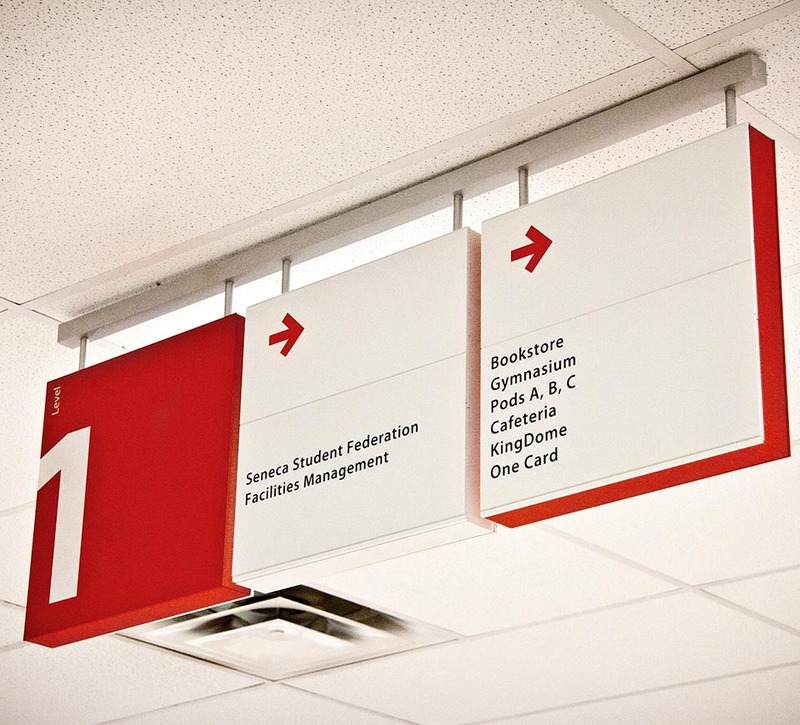 The interior signing and wayfinding program leveraged the simplicity of the Seneca identity and provided a tiered messaging schedule that allowed stakeholders quick access to the right information. Further refinement to strengthen the link to Seneca’s master brand identity. 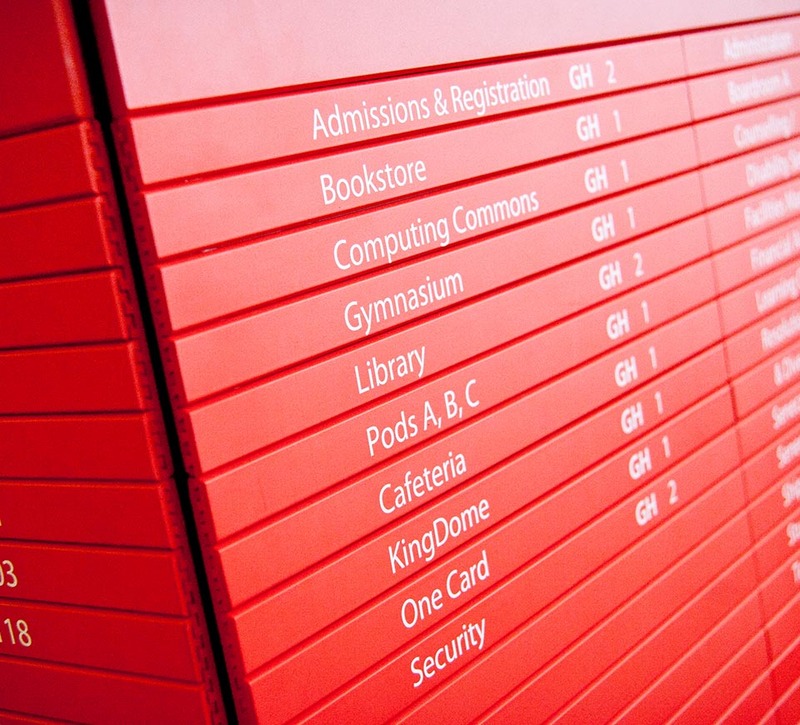 in addition to the development of signing specifications, message and sign schedule through to prototype expansion and final execution across Newnham and York campuses. 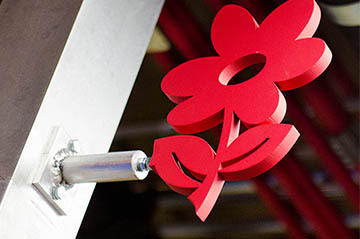 The sign system not only met the functional requirements of the project, it improved the aesthetics of the campus. 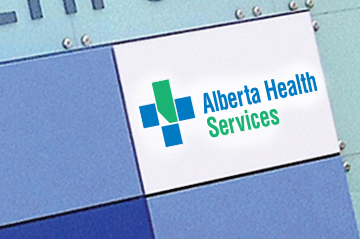 The implementation was easy to install and update, and is compliant with the AODA standards for accessibility. The program was introduced across the two campuses and is currently being rolled out to the remaining sites. Response from students and staff has been extremely positive.